Une récompense qui nous redonne du courage…. 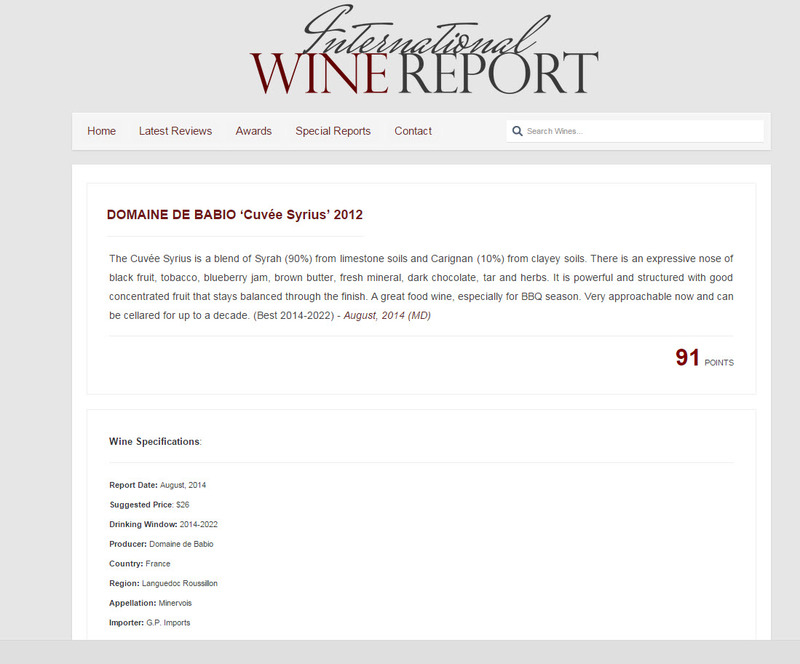 Et déjà le syrius 2017 a été remarqué par la Revue du Vin de France dans son numéro de juin 2018 comme un des 1800 vins à acheter cette année. Craggy, dry and ruggedly beautiful, the Minervois AOC is a sub-appellation of southern France’s Languedoc region. At its center is the medieval village of Minerve, named after the Roman goddess Minerva. 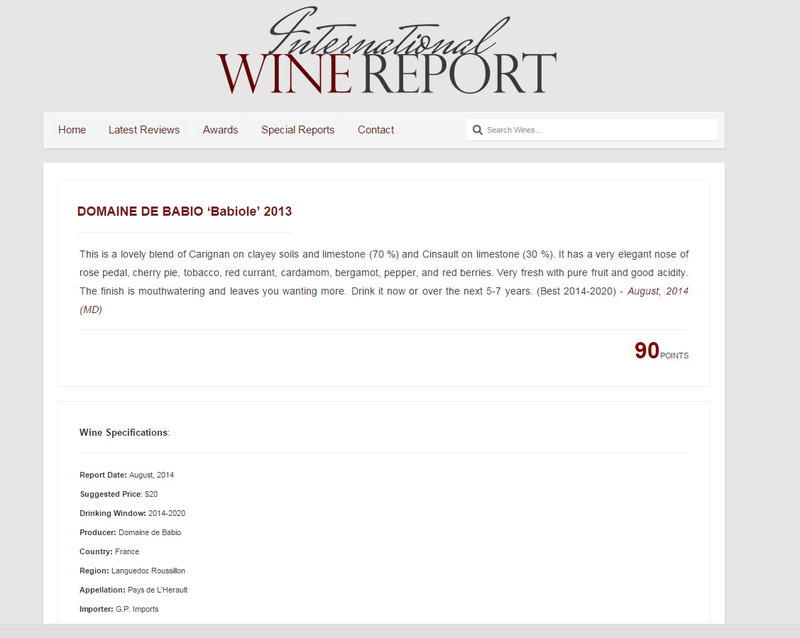 Most of the wines from here are red, generally blends of carignan, grenache, syrah and mourvèdre. 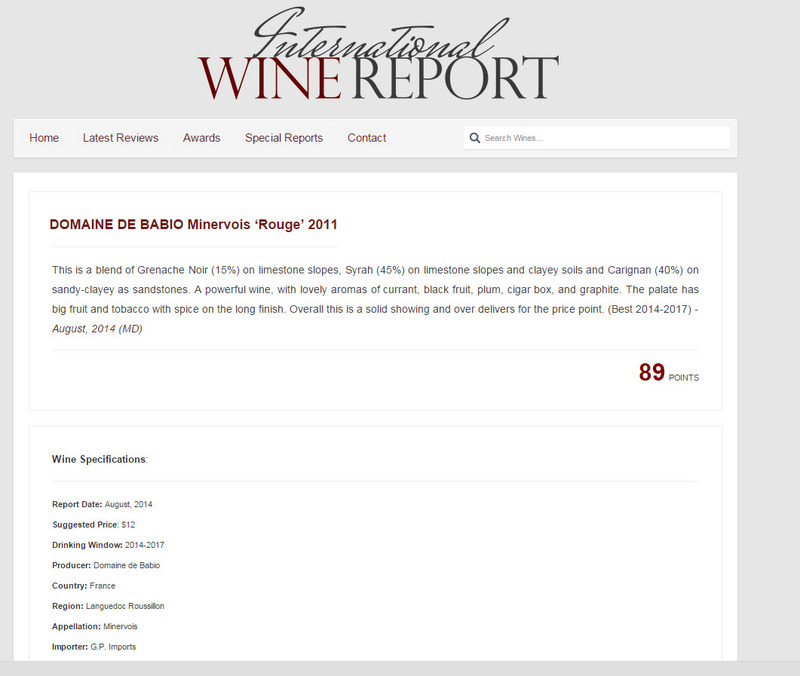 Structured and powerful, the wines can show dark, voluptuous fruit and a compelling minerality. 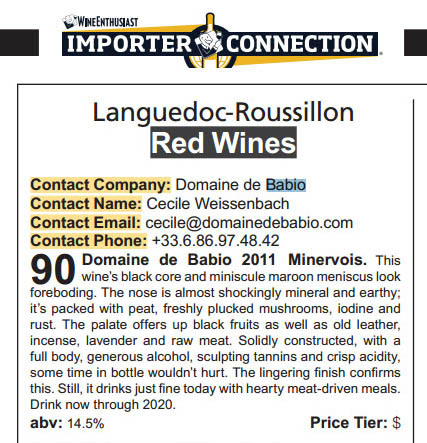 In 2003, Cecile Weissenbach, a young woman in her 20s, made an enormous leap and took over Domaine de Babio in Minervois. 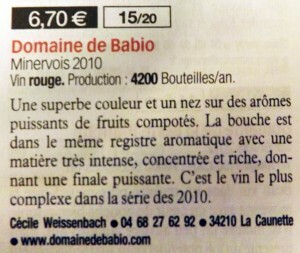 work and winemaking by herself, and ultimately producing delicious, polished wines from a rugged terroir. With its dark color and beguiling nose of boysenberry, roasted game, white pepper and dark chocolate, the wine is powerful, savory and complex. 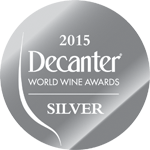 A Rhône-style blend of syrah and carignan with a little grenache, its structure and underlying texture give it a sense of metallic strength and minerality, while firm but ripe tannins offset the pretty, generous fruit. The layers of flavors interweave to achieve a great, earthy complexity. Even though the rich gaminess of this wine makes it especially well suited to lamb and beef — braises, stews and slow-cooked roasts — it is also flexible enough to pair with veal, pork, rabbit, feathered game and even poultry. It could be a prime candidate for the holiday table, complementing main courses like prime rib, rack of lamb, ham or turkey. Full-flavored vegetable dishes and composed salads, preferably embellished with a little cheese and/or smoked meat, are also excellent accompaniments. Serve slightly cool (64 degrees). Cett page regroupe les journaux / sites internet qui parlent de nous. 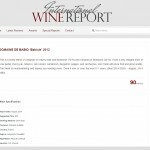 Blanc 2007 VdP : Le Grand Guide des Vins de France 2009 noté 15/20 (p 765). 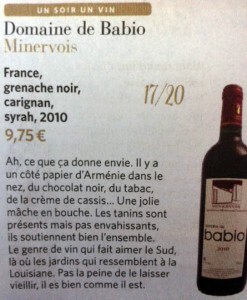 Terre de vins n°12 Juillet/Août 2011 (p. 56). 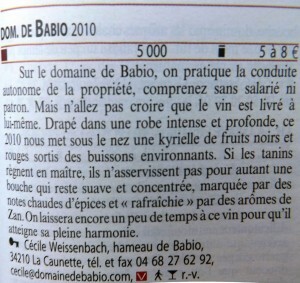 Babiole 2009 VdP : Le Grand Guide des Vins de France 2011 noté 13/20 (p. 574). 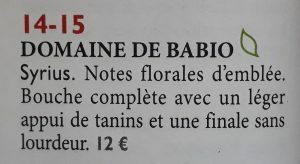 Le guide des meilleurs vins à moins de 20 euros 2012 noté 15/20 (p. 187). 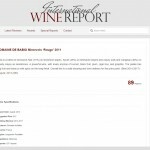 Rouge Minervois Cuvée Syrius 2006 : Le Grand Guide des Vins de France 2010 noté (p. 608). 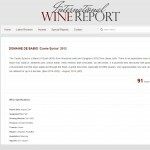 Rouge Minervois Cuvée Syrius 2007 : Le Grand Guide des Vins de France 2012 noté (p. 592). 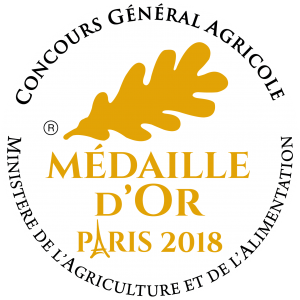 Médaille de bronze au Concours des Grands Vins de Macon 2009. 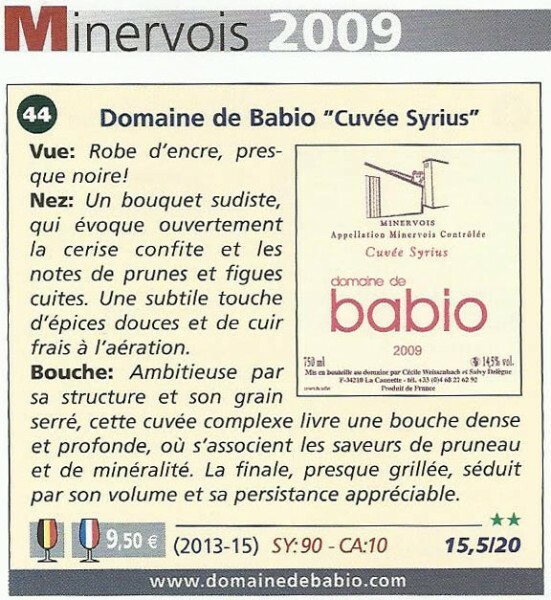 Rouge Cuvée Syrius 2007 : Médaille de bronze au Concours Général Agricole 2009.